At the half-way point of the financial year (April to September 2015), the government has borrowed £36.4bn. At the same point last year, borrowing was £44.9bn, so the improvement on the year is 18.9%. For the year as a whole the OBR forecast borrowing of £69.5bn in 2015/16, a reduction of 22% compared with last year’s £89.2bn. So at this point the government is broadly in line to meet the annual forecast. But analysis issued last week by the OBR confirm just how far off-course the government’s deficit reduction goals have ended up. 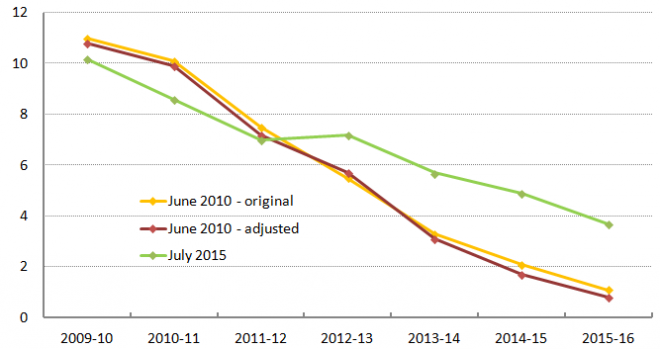 In their Forecast evaluation report the OBR adjusted the original June 2010 profile onto a consistent basis to reflect changes in the way the public sector finances are measured over the past five years. As a share of GDP these show borrowing in 2015/16 now expected to be 3.8 per cent of GDP, more than four times (4.6) higher than the June 2010 prediction of 0.8 per cent (on the consistent basis). In cumulative terms (i.e. adding up the gap between the green and red lines), the government has borrowed 7.5 percentage points of GDP more than they expected since 2010-11. This explains too why the strategy to reduce the public debt has failed, given debt broadly reflects the cumulative position on the deficit. This is most easily seen on the basis of the newly-issued internationally comparable figures (here), which have been more consistent over time (i.e. less affected by classification changes than the headline public debt figures). 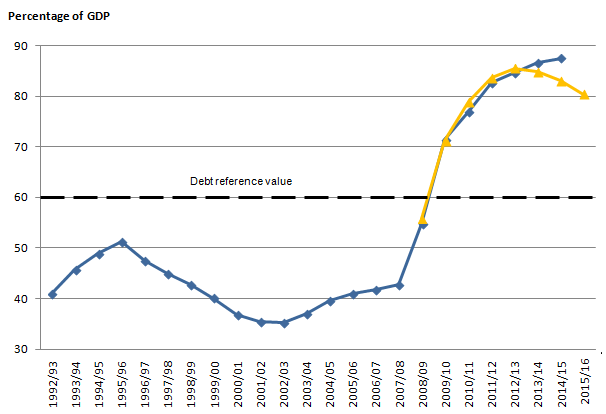 Looking ahead the OBR now expect government debt to improve by 0.9 ppts of GDP into 2015/16. However this feat of improving debt while the deficit remains high is achieved by a fire sale of assets, and, as the OBR stress, does not reflect an underlying improvement in the government’s finances. These may not seem large numbers, but they are the difference between a public finances / debt reduction strategy that is working and one that has failed. Moreover debt is within a whisker of the 90 per cent of GDP against which the whole global strategy of austerity was set to avoid. The reality of the data is a very very different world to the rhetoric of ‘budget responsibility’. “These may not seem large numbers, but they are the difference between a public finances / debt reduction strategy that is working and one that has failed.” ?? ” . . . the fact is that deficits do matter. They have to be sufficiently large (or small – whichever way you think about it) to allow the economy to sustain full employment and ‘fund’ the non-government’s desire to save overall (as manifest by the private spending decisions).